Man, now this is a name I haven't thought about in a while. 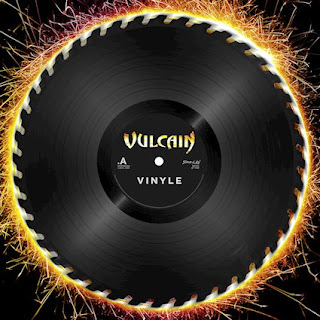 I remember first hearing Vulcain from my dad who would play me their records when I was a kid and I would absolutely freak out. Now the French metal visionaries who came so close to breaking through and going over the top are back with a new record, appropriately titled Vinyle out on Season Of Mist. While this may not be typical of the label, this is a helluva fun listen and one that is going to get you crashing around your living room in sheer sonic joy. There is a unique quality to the French 80s metal, it is often very inspired by AC/DC but seems to enjoy fusing Teutonic and English influences. The all French lyrics and strong accents that dominate the occasional English language chorus add a sort of national charm to the album. This is a record that have could come from nowhere other than France and which often revels in its old school sensibilities. Like other classic French acts such as Oceane and Trust the band has a truly interesting history, and this sense of history often shines through in the musical machinations of Vulcain's approach throughout Vinyle. All things considered, Vinyle is just a fun album that encapsulates everything which made Vulcain such a sonic force back in the day. With crunchy riffs, tight guitars and a lot of gratuitous vocal histrionics this is a band who will leave you with a smile on your face and your horns in the air. Sure it doesn't break new ground or take any unexpected left turns, but that's not really the point. Vulcain is about nothing but a good time and sinking your teeth into the interminable power that Vinyle brings into the world.